The picture is becoming clearer in the backdoor stage of the football championship. 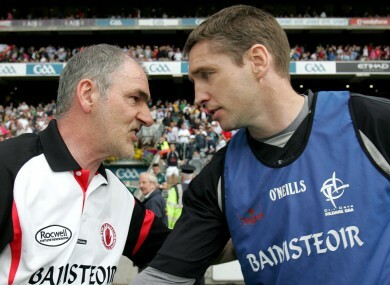 Tyrone manager Mickey Harte and Kildare's Kieran McGeeney. KILDARE AND TYRONE will go head to head next weekend in the standout tie of Round 3 of this year’s All-Ireland senior football championship. The draw took place on RTE Radio 1′s Morning Ireland programme this morning for Round 3 and 4 of the backdoor stage. And it’s the meeting of Mickey Harte and Kieran McGeeney’s teams which is clearly the glamour clash. Kildare will have home advantage for the game which is likely take place next Saturday July 20th. The Round 3 draw saw the eight winners of the Round 2 games all in the bowl with Galway also drawn to face Armagh, Wexford set to host Laois and Cavan facing a trip to play Derry. Meanwhile in Round 4, the beaten Munster finalists Cork will be in action against either Galway or Armagh while Meath, yesterday’s runners-up in Leinster, must take on either Kildare or Tyrone. The losers of next Sunday’s Ulster final between Donegal and Monaghan will take on either Wexford or Laois. While Cavan or Derry will have the reward of meeting the losers of the Connacht decider between London and Mayo. Email “Kildare to meet Tyrone in glamour tie after All-Ireland football qualifier Round 3 draw”. Feedback on “Kildare to meet Tyrone in glamour tie after All-Ireland football qualifier Round 3 draw”.